Having an emergency kit will help your family prepare for all types of disasters, and it can especially help when an evacuation is in order or someone gets injured. There are a number of supplies that should be kept on hand and store in an easy-to-carry container. The kit should be placed in the same easily accessible spot in your home all the time so all members of the family know where it is located. In the case of quick evacuation, you should have a kit loaded with enough food, water and supplies for your family. Although local officials will be on the scene shortly after, there may not be immediate attention given to everyone involved in the situation. Your kit will also come in handy in the event that basic utilities are out of use for any period of time. A fire emergency requires everyone to escape very quickly, so the kit cannot be too heavy or full to find quickly and carry easily. For a full list of supplies your fire emergency kit should contain, visit www.ready.gov. It’s important to make sure any food you have stored has not gone bad, and to replace it if it has. Anything that would be rendered useless in the event of an emergency should be removed and replaced as soon as possible. Making sure your kit is updated a ready to go in the case of an emergency is necessary. You should also take your family’s current needs into consideration if they have changed in the last year. Another essential part of fire emergency preparedness is having a plan. 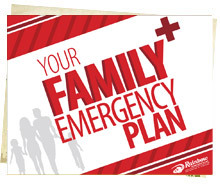 Besides knowing where the emergency kit is, all members of the family should also know the evacuation plan. Grab your family and walk through your home to locate all possible exits and escape routes. Everyone should know where these are to be able to find the best route out of the house during an emergency. Families with children should consider creating a map of the house that marks two ways out of each room. Determine a location outside of the home where everyone can meet up after exiting the home. Make sure to mark this place on the escape plan. If a fire disaster strikes, you can rely on the rapid, professional restoration services from the experts at Rainbow International®. For more than 30 years, the experts at Rainbow International have provided expert restoration services that revive hope, safety and confidence. Rainbow International restores, so you can recover and get back to your life.